Bath Mat Towelling 32" x 21" Coffee ..
Bathroom Set Rubber Backed 2 Piece Blue. Mach..
Bathroom Set 2 Piece Cerise. Machine washable..
Bathroom Set 2 Piece Coffee. Machine washable..
Bathroom Set 2 Piece Turquoise. Machine washa.. Luxury Bath Mat 2200gsm Black.. 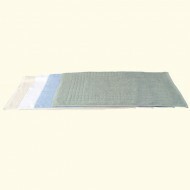 Luxury Bath Mat 2200gsm Cobalt.. Luxury Bath Mat 2200gsm Vanilla.. Luxury Bath Mat 2200gsm Walnut..
Supremely soft, washable 100% pure cotton in .. Smooth cork bath/shower mat gives non-slip pr..
Machine washable 100% cotton. 31" x 20". Luxu..
Bath Mat Microfiber available in Black, Vanil..